Rub-a-dub-dub, I’m Done With the Tub . . .
. . . of Boots Poffenberger material that is. 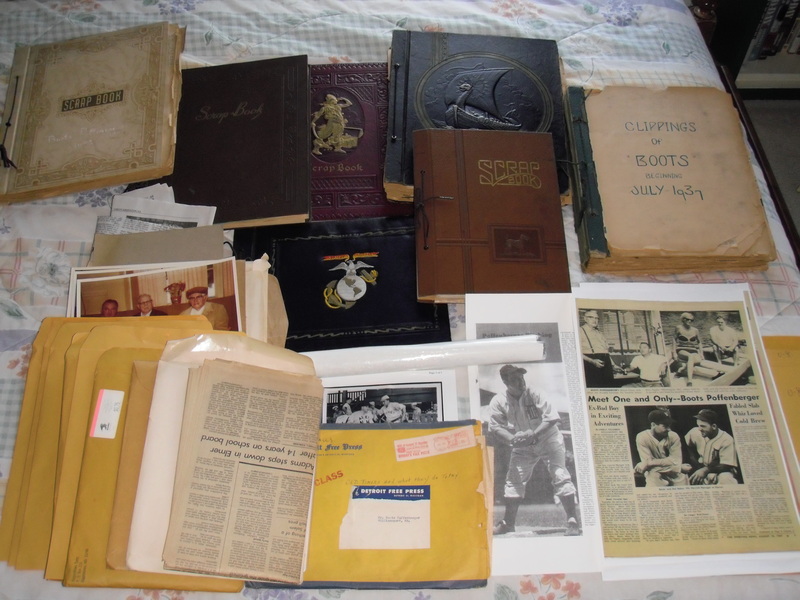 It’s taken me five months, but I’ve read virtually every clipping that fill scrapbooks and manila envelopes, that in turn fill a storage tub, about the life and career of one of baseball’s most colorful characters. Completing this task has brought me to the most critical phase of the writing process, as well as the most nerve-wracking and that is the proposal. Most publishers want to see a proposal consisting of an overview, chapter summaries, market analysis, and other possible pieces of information. It is the proposal which generally determines whether the publisher will ultimately accept the book and, therefore, the proposal has to be written at least as well, if not better than the actual book itself. You can afford a less than fascinating page or two or ten out of 200, but not out of 20. Boots and I have spent a great deal of time together since January and I feel a definite obligation to bring his remarkable life to light. I mean, we’re kind of buddies now, and your buddy deserves your best effort. Boots will get that, of course as will his family. After all, they started me on this wonderful adventure and have been kind enough to lend me all this material. In any case, if you believe in sending positive thoughts and good vibrations (the butterfly effect and all that) please send them my way next week as I hope to complete the proposal. Boots and I would appreciate it. This entry was posted in Boots' biography, Writing and tagged baseball, baseball books, book proposals, Boots Poffenberger. Bookmark the permalink. 2 Responses to Rub-a-dub-dub, I’m Done With the Tub . . . Looking forward to the book. Let us know if you get to the Atlanta area. We have lots of empty bedrooms these days 😦 and you are welcome to stay with us. Thanks, Jill. Actually, Martha will be attending a SHRM convention in Atlanta in June. And hey, maybe a publisher will send me to Buford to research Boots’ time with the Bona Allen Shoemakers!